NB9027xh: 11.25v 1600mAh NiMH battery for Motorola Radius, P-10, etc. Home > Commercial-Land Mobile-Marine > NB9027xh: 11.25v 1600mAh NiMH battery for Motorola Radius, P-10, etc. 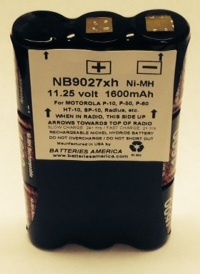 NB9027xh : 11.25volt 1600mAh rechargeable long-life NiMH battery for Motorola business radios. Fits in Mot. Radius, P-10, P-50, SP-10, HT-10, P-60, etc (worldwide versions). Replaces original HNN9027, NB9027, NTN9027. Re-charges in OEM chagers and approved NiMH aftermarket chargers. These battery packs are MADE IN USA. Exclusive Batteries America product !